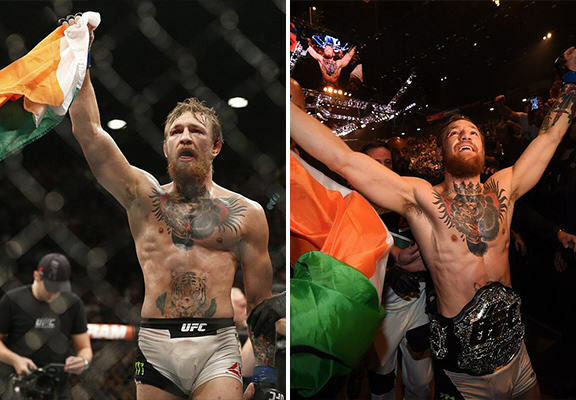 Irish mixed martial arts superstar Conor McGregor sent his travelling supporters into raptures with a second round TKO of top 145lbs contender Chad Mendes at UFC 189 in Las Vegas. In the process, the 26-year-old captured the UFC interim featherweight championship and is expected to face champ Jose Aldo to unify the belts later this year. Aldo withdrew from last night’s main event due to a rib injury, and Mendes stepped up to face ‘The Notorious’ McGregor on two weeks’ notice. Wrestler Mendes dominated much of the opening two rounds, putting McGregor on his back several times. However, surviving the toughest test of his career, McGregor landed a flurry of strikes to earn the TKO win with just three seconds left in the second round. To come in here and hear all this applause, it’s just amazing. I truly appreciate it. I’ve been hearing all the time that I’m protected from this style of opponent, that I’ve been gifted a title shot. So my title shot went running, and they gave me a guy who I was supposed to be protected from. I knew I was going to prove to people that I’m a true fighter. It doesn’t matter who it is. I show up and I’m a professional and I’m confident in my abilities. In my opinion, Jose went running. I had bigger injuries leading up to this fight than that bruised rib. I still showed up here and performed. So in my eyes, Jose’s gone running. If he wants to come back, he can come back. But I swear to God, his day will come. However, despite the overwhelming turnout of his adoring Irish fans, the UFC claimed afterwards that the highly anticipated McGregor vs Aldo bout will not take place in Dublin as many hoped. The unification fight is expected to occur in Las Vegas. Wherever the fight takes place, it will be some spectacle and the UFC clearly have dollar signs in their eyes right now when it comes to the charismatic, talented McGregor. I’m not sure how they’re going to outdo Sinead O’Connor playing Conor’s walkout music live next time around though!